Godward was fascinated by classical Roman civilisation and feminine beauty. The sumptuous bright colouring and sculptural beauty of the model are particularly striking here. The flowing material of the dress is a huge contrast to the hardness of the marble. 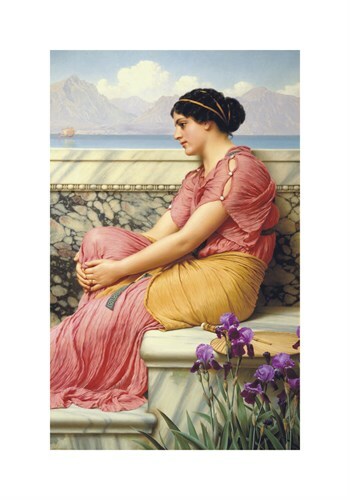 John William Godward was born in 1858 and made his debut at the Royal Academy in 1886. He went on to exhibit regularly there and at the Royal Society of British Artists and became a Member of the latter Society in 1889. Godward specialised in classical genre scenes featuring Grecian beauties in flowing robes, similar in style to Lawrence Alma-Tadema but with his own very personal variation. He chose his models with care, instead of drawing them from a large pool as was the wont of his contemporaries. This was partly due to his shy and sensitive nature, which also accounts for the small number of paintings he sent for exhibition during his lifetime. However, Godward's work reached great heights of popularity despite his lack of self-promotion. The end of the First World War sounded the death knell of English classical art, of which Godward was one of the leading exponents. Intellectual modernism shouldered out the gentler genres and in the First World War the lushness of the English Neo-Classical school seemed crassly inappropriate. Sir Edward Poynter, a founder and leading exponent of the school, resigned as President of the Royal Academy in 1918; younger artists like Godward struggled on. By 1922, his heart broken by the harshness of the new world, Godward surrendered the unequal fight and gassed himself in the oven. Godward exhibited at the Royal Academy from 1887.